Why doesn't my game appear in my Purchase History? The game may have been purchased using a different account. Games will only appear on the account that was used to purchase them. 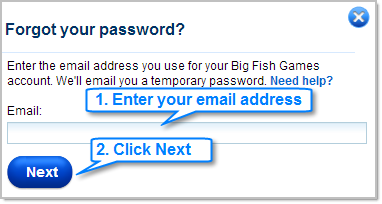 If you have an additional account under a different email address, please sign in with the other email address. Next, check that account's Purchase History for your game. The game may be a free trial that has not been purchased. A confirmation email is sent immediately after a game is purchased. Please check your inbox and your Spam or Junk mail folders to make sure you received the email. The game may be a Free to Play game. Free to Play games are free to download and play, so they will not appear in the Purchase History. Purchased on a different account, but can't remember your password? Click the Sign Out link at the top of the page. Enter the email address associated with the account you wish to access. Check your email at the email address entered in step #4 above. Return to the Sign In page and sign in with the email address and the reset password. For more information on requesting a new password for your account, please take a look at the Forgot Password help article.